I like that minimalistic casualness that this photo portrays. NICE: I had a great pair of navy linen pants that I bought in Victoria, British Columbia, Canada. I still have them but I don't intend on being that size again so they will eventually make their way to a consignment store. In recounting why in fact they were/are so NICE, it has to be a combination of elements - the fit, the feel, the length, the look . . . all of the above. They were lined with a lightweight linen, heavier than, but gauzy like cheesecloth, and only from the waist to the top of the thigh, which gave structure but not bulk. NO THANKS: My NO THANKS pair were a white pair of lined linen trousers. Now you would think that lined linen pants would have a great look and they did. The problem is that it's summer and it's hot! Perhaps if they were lined with a lightweight cotton muslin, some other natural fabric or like the NICE navy ones, they would have been fine; however, a polyester lining defeats the purpose of keeping "cool" with linen. 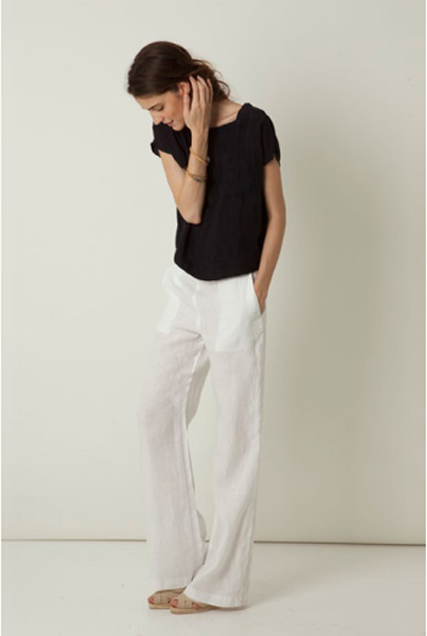 NEW and NOTE-WORTHY: These do not belong in the NICE category because the tie at the drawstring waist and the back pockets seem to "cheapen" these unlined linen/rayon blend pants but the price was NOTE-WORTHY (in fact, they only cost $20.00 Cdn. for a pair) and the fact that I bought three pairs is also NOTE-WORTHY. As well, perhaps NOTE-WORTHY but not true is that they were labeled as a size 4 and I'm a definite classic 6. 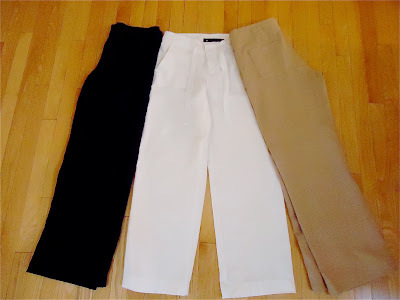 I bought the 55% linen and 45% rayon blend wide leg trousers made in Cambodia in a camel beige, white and black. According to linen purists, the negative attributes of the rayon outweigh the positive of the linen. Nonetheless, these pants don't crease as much and feel pretty good to me. NEED: After the purchase in triplicate, I do not NEED another pair of linen pants for a good while. When I iron my linen I sometimes use a spray starch. It gives them some crispness and makes for a smoother finish, at least for a little while. See my linen post for more care tips.